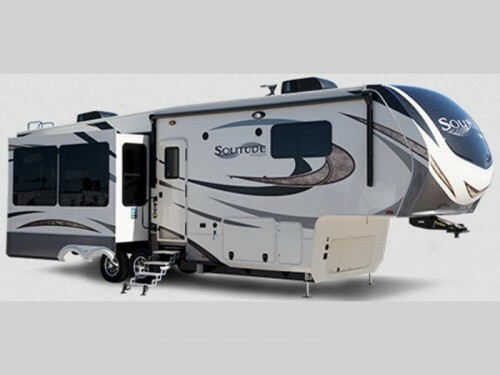 Save Big on our Grand Design Solitude Fifth Wheels! Have you seen the sale prices we are currently offering on our Grand Design Solitude fifth wheels? Right now you can save up to $17,000 on these great RV’s. Choose from three to five slides floorplans all with amazing features both inside and out! 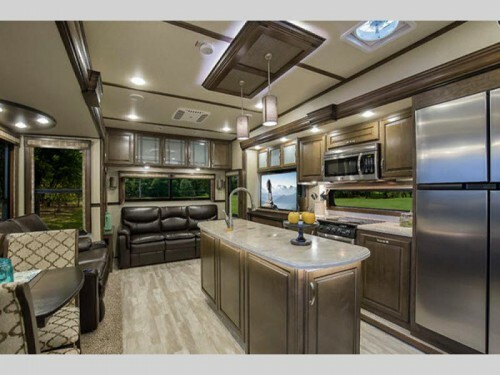 Check out the Grand Design Solitude Fifth Wheel! As soon as you walk up to the Solitude fifth wheel, you will find amenities to make your RVing life better. Things like the slide-out awning toppers and hydraulic leveling system will help protect the camper when you are parked, and with the power patio awning with LED light strip, you’ll find it easier to sit and enjoy the outdoors around you. Stay comfortable with residential features in the living room. Moving inside, each room of the Grand Design Solitude will be spacious and full of luxury features. Take the living room for instance. 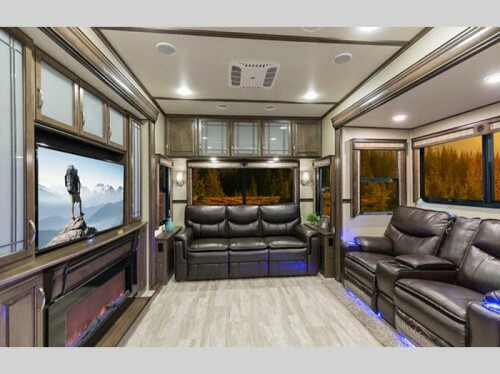 Here you will find comfortable furniture with the double tri-fold hide-a-bed sofa and power reclining theatre seats with LED lighting, heat and massage features, all of which will give you the perfect view of the electric fireplace and big screen LED TV. Stainless steel appliances and solid surface countertops are just a few of the amenities in the high quality kitchen. The kitchen area will not only be functional but also beautiful. The stainless steel appliances, solid surface countertops, and real tile backsplash will create a modern space with only the highest quality pieces. And with the oversized pantry, prep space for a dishwasher, and residential faucet with pullout sprayer, you will feel right at home anytime you cook. Find a king or queen sized bed in the spacious master bedroom. 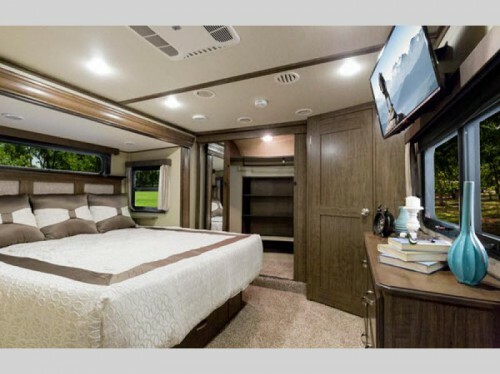 The bedroom area of this fifth wheel will be just as impressive as the rest. Get a queen or king sized bed, both with under bed storage for additional space for your belongings. Plus, the individual reading lights over the bed and extra LED TV will give you lots of activities to do in the evenings before falling asleep. With our low prices on our Grand Design Solitude fifth wheels, you will love everything about these incredible RV. Contact us today to find out more info, or just stop by our location to learn about all of the features you can get for our discounted prices!